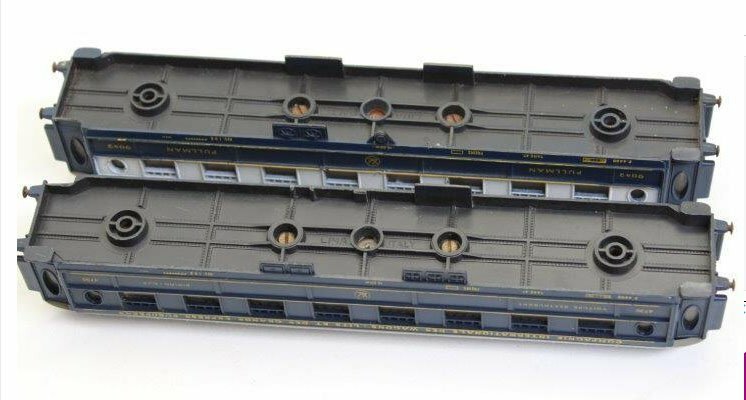 I have three Lima Italy pullman coaches and one parcels van. I bought them for my sons many many years ago. I would like to put lights in to them, but I am having trouble taking them apart. It looks like I will have to take the roof off , but I do not want to force it, in case I cause any damage. There are no screws visible holding the roof on, just three holes in the chassis which don't appear to serve any purpose. Any tips?. Thanks DiveController. These are a couple of photos of one of the coaches. I have pulled on the roof, but I am afraid I will break it. As you can see in the chassis, there are three holes, but I can't figure out what the purpose of these are. I've never dealt with one of those specifically, but, in that sort of situation, there can often be a couple of screws at the far end of the two "tubes" going up from the floor. Can you see through the windows if they go right up to the roof?
' there can often be a couple of screws at the far end of the two "tubes" going up from the floor. I reckon Broithe's approach is correct, it looks like yours have the screws removed! are they second hand? as some clever chap may have glued them without the screws. Ah, right, I was actually wondering if there were screws right up at the top end of the tubes, they're often black and barely visible. Another possibility would have been screws hidden by the bogies, but that's excluded by his pictures, too. Sometimes, a bit of gentle pulling about can reveal where the splits are and you may still be able to part them - but there is always an element of risk. Lima did, at times, mould the roof and windows in one clear piece, then painted the roof section. Hi Lads, I finally found what was holding the roof on. Not a screw to be found anywhere. As you can see from the photos, the glazing at the end of the coach, at the gangway window has a small lip, which when pushed in, enabled me to pull off the roof and glazing all in one. I can't remember where and when I got the coaches. I got a number of coaches from a work mate, many years ago, so these may be some of them. Now for lighting. Thank you all for all your advice and help. Always worth a trial run to see if any light will bleed though the roof or sides. I've found 'silver' paint to be fairly leakproof. Silver paint it is then. Thanks for the tip. I think I am going to need a lot of paint for these roofs. You can also have 'edge-lighting' issues around the windows - experimentation is the key to success.